Clanna was amazing this time. 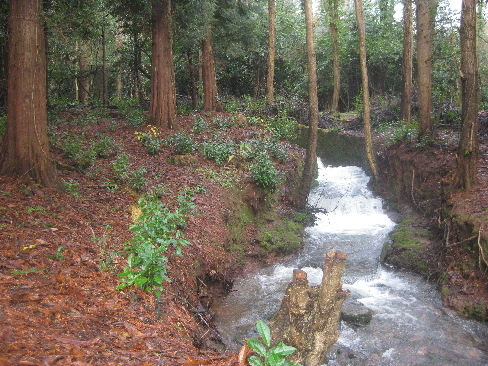 The previously dry stream with mottled puddles had turned into a torrent of water. If you look at the diary pages from previous visits to Clanna you can see what we mean. 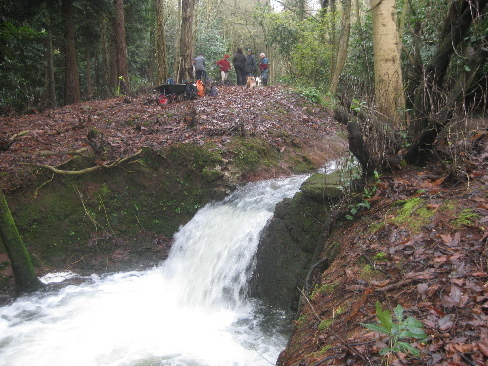 We think that this was a result of the clearance of over hanging laurel, the torrential rain we have had in the past few weeks and the fact that a sluice gate has been closed further upstream allowing the water to travel through. We met a local fisherman who has lived nearby for years and he had never seen this torrent before but that is possibly because it had all been totally covered in laurel until we came along! 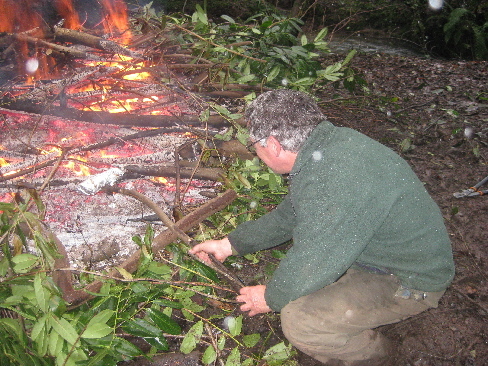 We were intent on burning off the debris and cutting back more laurel. 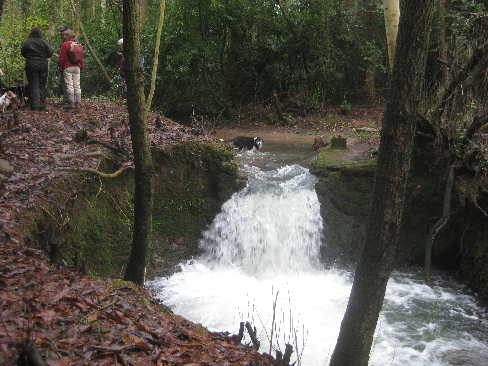 One of our dogs is enjoying a paddle in a stretch of the stream which had previously been bone dry! We left the log in place. The light of the motorbike looks as though it is on but that is just the reflection! The low growing re-growth of the laurel on the left of the picture will be sprayed off in the spring leaving the area open. 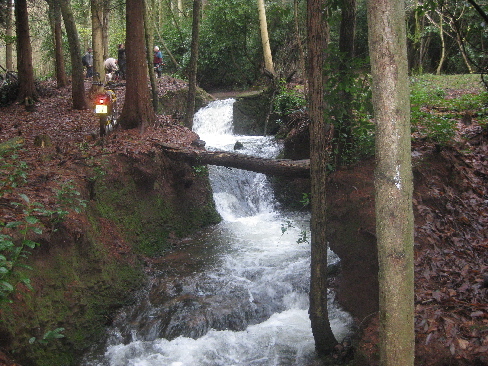 This is at the bottom of the stream as it joins the lake. 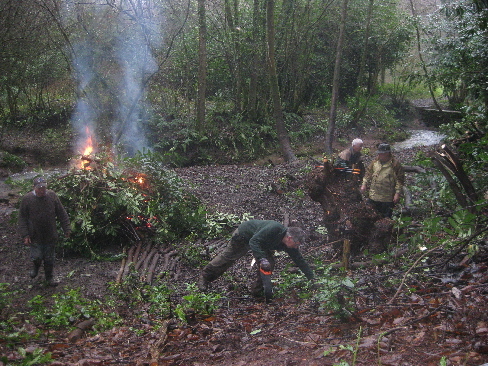 The team are burning off the old laurel which we cut last time and some of the new branches. The fire cooked trout is now ready to eat and we all had a mouthful (even the self professed vegetarian amongst us!) Absolutely delicious! Adipose fin present. 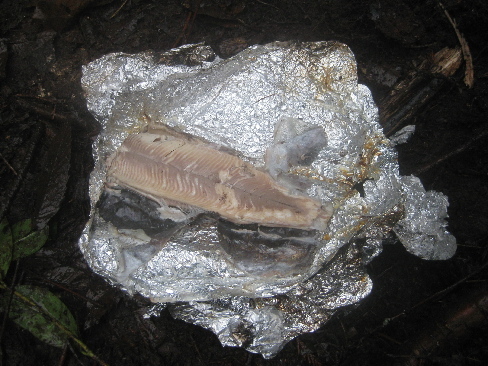 Caudal penduncle deep and flat sided, tail fin slightly forked. Scales very small. Rainbow trout coloration distinctive, usually a pinkish rainbow stripe along sides, dense black spots on back and upper sides, dorsal, adipose and caudal fins. A North American fish widely introduced to Europe. 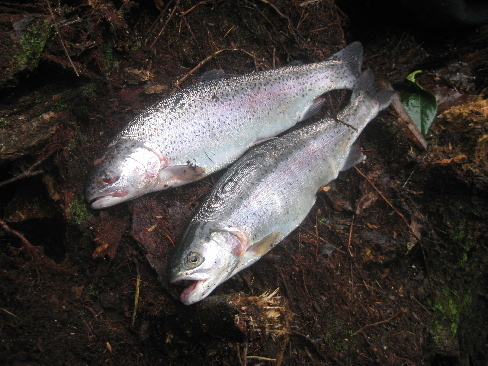 The Rainbow Trout mostly occurs in artificial still waters, reservoirs, lakes and in some rivers. Lives in similar places to brown trout but can tolerate higher temperature and less clean water.